Best iPhone Cases for Moms on Mothers Day! Flowers don’t last but your Mom’s device will if you gift her one of our slim and protective cases instead. Get 20% off our best iPhone 6s/6 cases for moms and all of our cases this Mother’s Day and give your Mom something she’ll actually use and love! Check out our beautiful CandyShell Clear in Beaming Orchid or Rainstorm Blue. Offering all the protective qualities of our military-drop tested CandyShell Clear, Mom will love a slim iPhone 6/6s clear case with an elegant tint of color. Offering two layers of next generation clear material that resists UV yellowing, these colorful CandyShell Clear cases will a last a lot longer than a bunch of flowers this Mother’s Day! 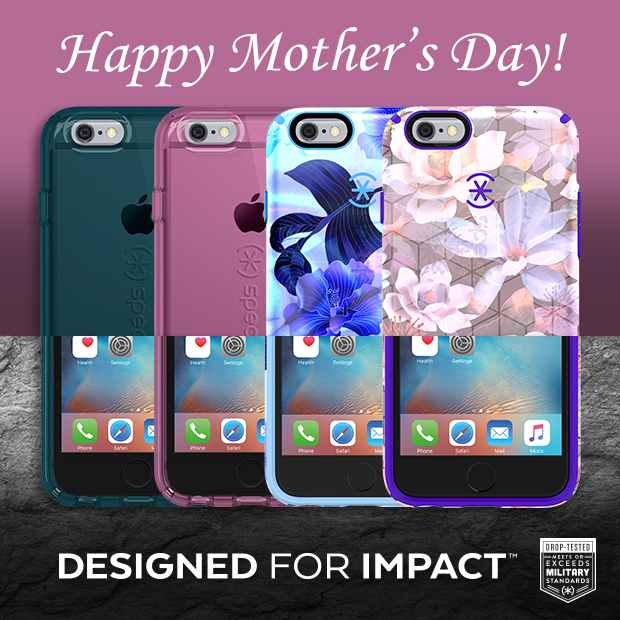 If your mom still loves her flowers, we’ve got you covered with a new luxury edition iPhone 6/6s stylish case. Take your pick of these floral military-grade drop tested CandyShell Inked Luxury cases. Choose either Hawaiian Silk or Frosted Floral, for a head-turning, sophisticated look that will protect your Mom’s device. With 20% off you can spoil your Mom and give her only the best this Mother’s Day. Take advantage of our site-wide sale, check out all of our best iPhone 6/6s cases for moms and all of our slim and protective cases at SpeckProducts.com.